Anja's Food 4 Thought: Just Prawns... and nothing else!!! Just Prawns... and nothing else!!! Today is the 3 October, the anniversary of the German reunification in 1990! I dare to say that most of the things in my life would not have happened without this historic event. I was born in East Germany. We were not allowed to travel anywhere beyond the eastern block of Europe under the Communist regime that ruled until 1989. Once the borders were open and once I finished school and left home, I did not stop visiting foreign places. First Europe of course, then further away to America, then even further away to South Africa. There I met my now-husband. Before I met him, I basically lived off cheese sandwiches. He taught me a lot about food. In fact, he made me enjoy and explore cooking. One of the consequences is this blog. 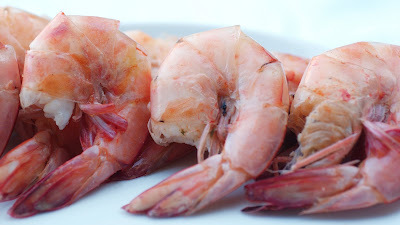 The recipe cannot be any simpler: Buy the freshest good quality prawns, the bigger, the better. They should be close to king size. Get them deveined at the shop. That means the peel has to stay but the back will be opened and the vein taken out. Prepare at home, chill and eat!! Cut the onion into slices. Add to a big pot of salted water and bring to the boil. Add the prawns and cook for 2-3 minutes. Not much longer than that!!!! Drain and cool in the fridge. Serve cold from the fridge with wedges of lemon and mayonnaise for dipping. 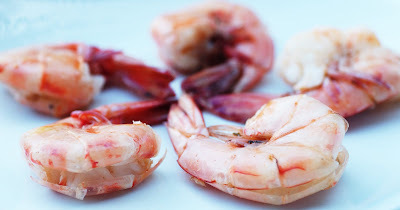 Eat like this: Drizzle lemon over the prawns, Remove head and tail. Peel off the skin from the remaining body. Eat as it is or dip into mayonnaise.